As indicated in the first two installments of the series, the No Kill Advocacy Center has written model legislation, the Companion Animal Protection Act (CAPA),that sets minimum standards for shelters, including a modest holding period, a ban on the gas chamber, a ban on heart sticking, a ban on killing with empty cages, a ban on killing when rescue groups are willing to save those animals, and an end to the practice of killing “owner surrendered” animals within minutes of arrival at the shelter without ever giving them a chance at adoption. CAPA mandates the programs and services which have increased lifesaving in shelters, follows the only model that has actually created a No Kill community, and focuses its effort on the very agencies that are doing the killing. In 2010, the state of Delaware passed a modified version of CAPA. Since then, killing in shelters has declined 78%. Nor is Delaware alone in achieving success. The head of the animal control shelter in St. Paul, MN, recently stated that by putting in place the programs and policies of CAPA, she’s been able to save 90% of the animals, working in earnest to return the term “euthanasia” to its dictionary definition. The same occurred in Austin, TX. And in California, similar legislative reforms are saving tens of thousands of animals killed in years past. But not everyone is happy with CAPA’s success. The directors of kill shelters and the large, national groups, such as the Humane Society of the United States and the ASPCA, have worked to undermine the effort to bring desperately needed and common sense reform to shelters nationwide. The groups have opposed CAPA-type laws in California, New York, Texas, Florida, Minnesota, and elsewhere. In fact, when Delaware CAPA was signed into law, I was interviewed by the Dover Post about the bill. As I was telling the reporter why I thought the law was a great step forward, the reporter said to me: “Yes, of course, who could be against it?” I could have told him who: HSUS, the ASPCA, PETA, and their acolytes. Instead, I bit my tongue. Indeed, one of the reasons CAPA was able to pass in Delaware (without a single vote in opposition), where it has failed to pass elsewhere, is because these groups did not know about it until after it was signed by the Governor. Despite Delaware CAPA’s lifesaving success, it is admittedly far from perfect. But unlike the current critics of the law who paradoxically highlight its very effectiveness at limiting the ability to kill animals as the reason they oppose it (arguing that it goes too far protecting animals), in truth the only valid criticism of the law is that it did not go far enough. While the ideal law regulating shelters would ban the killing of dogs and cats and would prohibit the impounding of community cats except for purposes of adoption, reclaim, or spay/neuter and release, given that state and local governments are not likely to pass such sweeping laws at this time in history, especially given wide opposition from groups like HSUS, the ASPCA, and PETA to even simple, interim changes such as preventing the immediate killing of animals the moment they enter a shelter, CAPA was written as “model” legislation to provide animals with maximum opportunities for lifesaving. And like all legislation, the final version of Delaware CAPA involved compromises that excluded many of the provisions of the No Kill Advocacy Center’s model legislation. This was necessary, according to supporters, in order to get the support of the Kent County SPCA (KCSPCA), arguably the state’s most regressive animal shelter. And without a private right of action so that private citizens can ensure obedience to the law when the government will not, enforcement of CAPA in Delaware rests with the Department of Agriculture, which has so far not lived up to its responsibility. In other words, it is premature to say that animals in Delaware or in Delaware shelters are safe as a collective group, but it is fair to say that they are far better off than they use to be. It will only be when the companion animals entering Delaware shelters are no longer subject to prohibitions based on arbitrary criteria, when they are no longer subject to any negative discretion on the part of shelters, and when killing them at all becomes non-negotiable that these animals will finally enjoy the full range of protections they both need and deserve in shelters. Nonetheless, by the most important measure of shelter performance—saving lives—CAPA is clearly a success which means that for many individual animals, CAPA has meant the difference between life and death. With a decline in killing of 78%, Delaware is on the verge of ending the systematic killing of animals in all its shelters. The success of CAPA in Delaware makes clear how quickly and efficiently we can dramatically reduce shelter killing in this country by directing our efforts at humane societies, SPCAs and other shelters—the very institutions that are actually killing the animals—rather than trying to reform a public that cares more about animals and goes to greater lengths to shield them from harm then the very organizations which are supposed to be setting the standard for their care. For shelter directors accustomed to operating their facilities with little to no oversight, no lifesaving expectations, and virtually unfettered discretion, laws like CAPA are deeply threatening. It should therefore come as no surprise that shelter directors and those who lobby for the interests, such as HSUS and the ASPCA, have worked to defeat CAPA in states across the country. Coming to their aid are naysayers in Delaware who are maligning CAPA as “divisive,” “dangerous,” and “expensive.” Below are responses to some of the dishonest criticisms being leveled against Delaware CAPA by its opponents. Claim: CAPA caused a distemper outbreak at the Kent County SPCA. Analysis: CAPA did not cause a distemper outbreak at the Kent County SPCA (KCSPCA). In fact, they also blamed Hurricane Irene for the outbreak. In truth, it was the KCSPCA’s failure to vaccinate animals on intake, as well as poor cleaning protocols that led to a panleukopenia (distemper) outbreak. Prior to the passage of Delaware CAPA, the KCSPCA was able to legally kill any cat it chose to kill immediately after the cat was impounded. And, in many cases, the KCSPCA chose to do just that: with seven out of 10 cats losing their lives. Admission into the KCSPCA for many cats meant a quick trip from the front counter to a back room out of public sight where the cat was immediately injected with a lethal dose of poison and discarded like trash in a garbage bag. Despite the obvious cruelty to cats, the cruelty to cat lovers who might be searching for their lost companion, and the fact that the KCSPCA was under no obligation to perform animal control services for cats, this was entirely legal. Not anymore. Now, rather than simply kill any cat it chooses to impound, the KCSPCA is subject to the same basic regulation that shelters in other states have been required to honor for decades: a minimal holding period. In the case of Delaware, that holding period is still, after CAPA, only 72 hours (one of the compromises made in enacting it into law). Indeed, this holding period is nowhere as generous as it should be, being second only to Hawaii’s 48 hours as the lowest holding period in the country, but it is better than what came before, which was no holding period at all. Not surprisingly, adoptions are up, transfers are up, and the reclaim rate for cats has jumped five-fold. Of course, keeping cats alive rather than simply executing them within minutes of entering the pound means that the cats must be adequately cared for during their stay. 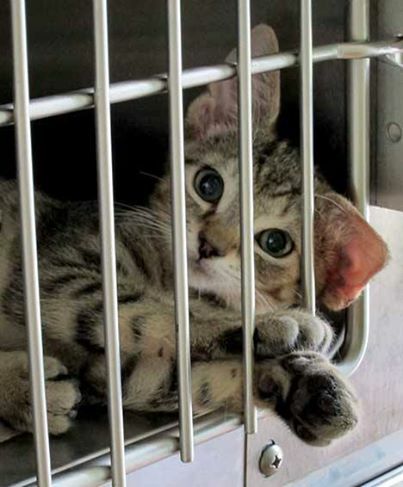 Anticipating that Delaware CAPA would result in cats being kept alive in shelters longer than before, CAPA also mandated that shelters follow basic vaccination protocols, including vaccinating for distemper upon intake, something the KCSPCA should have already been doing but was not. Individual cases of distemper happen. But distemper outbreaks in a shelter environment are always the result of two problems working in concert: failure to vaccinate and sloppy cleaning and disinfection practices. It was the Kent County SPCA’s own irresponsibility that caused a preventable distemper outbreak, not the passage of a law designed to protect animals from killing and illness. Claim: CAPA Forced the Kent County SPCA to close its doors to cats and place others on a waiting list, resulting in cats simply being dumped on the streets. Analysis: There is nothing in CAPA that forces any shelter to limit its intake, only to provide cats it does take in with a minimal holding period and minimum standards of care, such as vaccinations. Providing animals a chance at adoption or lost animals a chance at reclaim by their families should be at the heart of every animal shelter’s mission, but the KCSPCA has chosen to portray those expectations as onerous. So what is the real reason the KCSPCA has chosen to limit its intake of cats? Since the passing of CAPA, any cat the shelter takes in must be vaccinated and cared for during a mandated holding period rather than immediately killed, as well as common sense provisions such as not killing them when space is available. And because keeping cats alive rather than killing them requires the shelter to feed, water, socialize, clean and care for them, the shelter has chosen to minimize its workload by limiting its intake. Despite the fact that open admission, No Kill animal control shelters with far greater per capita intake rates than the community served by the KCSPCA now exist throughout the country—putting the lie to the claim that open-admission shelters cannot be No Kill or that No Kill shelters must, by definition, limit their intake—given the obviously troubling and misplaced priorities of the KCSPCA’s current leadership and its history of killing cats, the fact that the shelter is now limiting its intake rather than admitting and immediately killing cats is, in fact, a very good thing. To the extent that the KCSPCA has chosen to employ a waiting list, moreover, it need not result in cats being dumped on the street if it is properly administered. A study at a shelter that instituted an appointment system for people wanting to surrender animals (with an exception made for emergencies) found that an animal from that jurisdiction was taken to another shelter only three times the entire year. Meanwhile, the number of stray animals (which were not subject to an appointment system) continued to decline, rather than increase as predicted by those who claim that shelters which do not unconditionally accept every animal were putting those animals at risk for abandonment. In other words, managed intake does not increase abandonment rates. Our shelters can and should be the safe places we want them to be. The choice does not have to be between turning cats away and what we have now, a system of death camps where animals are killed out of expediency. In fact, if the Kent County SPCA wanted to, it could take in all those cats and find them homes. Other shelters with a far greater per capita intake have already done it. Or it could choose to manage intakes and find them homes. Or it could choose to take them in, neuter them, and return them to their habitats. Without CAPA, they chose to simply kill them. That they can no longer do so is cause for celebration. Claim: The decline in killing in Delaware is because shelters have closed their doors to cats (and dogs), resulting in fewer intakes. Analysis: It is true that fewer animals are entering Delaware shelters since the passage of CAPA but that is, in fact, a good thing. Although nothing in CAPA specifically prohibits shelters from taking in the same number of animals as before, CAPA has changed the calculus shelters use to determine whether or not to impound an animal, making what was once prevalent due to its ease—impounding and killing—no longer so. Shelters that once had full discretion to take in cats and immediately kill them find that they must now hold animals for a period of time instead. Many municipalities have responded to this choice by enacting TNR programs for community cats, sparing the lives of these animals who were once systematically killed and another factor influencing the decline in impounds as well, a very welcome and exciting development. In addition, hundreds of animal control shelters across the nation serving every possible demographic in America are proving that if a shelter wants to take in every animal in their community who arrives on their doorstep, they can and still respond to their needs humanely and without resorting to killing. To do so, they must embrace the most innovative and compassionate form of animal sheltering, the No Kill Equation. There is nothing in place to prevent Delaware shelters from adopting, in total, each of these lifesaving programs and services so that they, too, can assist every animal rather than end their lives or refuse to take them in. But even if they chose not to do so, if CAPA is forcing Delaware shelters to reevaluate and alter some of their traditional policies and protocols that have long caused the needless loss of life, then the law is fulfilling, not failing, in its intended effect. Despite this, the director of the Kent County SPCA says, “The once open door shelter which handled all the issues is a function of the past thanks to CAPA,” nostalgically harkening back to a time when cats were simply taken in, killed, bagged, and sent to the landfill within minutes of arrival. For everyone else (i.e., those who love cats), that the KCSPCA can no longer do so is a good thing. In short, “open door” does not and has never meant “more humane” when the end result is death. Claim: CAPA has resulted in shelters turning their backs on cats, allowing them to continue breeding. Analysis: In truth, Delaware is becoming more progressive toward cats, as Delaware municipalities have begun to embrace neuter and release ordinances in lieu of round up and kill campaigns, finding that doing so not only curtails breeding and saves lives, but cuts costs. Since CAPA passed, municipalities like Delaware City and Harrington have begun TNR programs. This is welcome news and will lead to even more dramatic declines in killing. Analysis: As a threshold matter, it should not be the role of individuals who claim to care about animals to be condoning shelter or government reluctance to embrace or maintain positive improvement for animals, regardless of whether they cost money or not. Indeed, the ethical imperative is to require them to do so. That critics of CAPA are claiming that animals should not be given more protections through law if it ever requires funding is the antithesis of the message and goal one would and should expect from people wearing the mantel of animal protection. Indeed, it is impossible to imagine any other social moment suggesting that their issue is not one that deserves additional financial expenditures. Tragically, this is the exact argument CAPA opponents are making. But even if we were to accept that point of view, one of the most enduring myths used to condone the wholesale slaughter of millions of animals in our nation’s shelters every year is that saving their lives is too expensive. While it seems logical to assume that saving rather than ending the lives of animals will cost more money overall, this is an overly simplistic view that ignores the high costs associated with killing, the many savings associated with lifesaving, and the increased philanthropic support from the public resulting from shelter reform. Not only did the California Department of Finance find that revenues associated with greater lifesaving offset costs of implementation of the state’s shelter reform law, but many of the programs identified as key components of saving lives are more cost-effective than impounding, warehousing, and then killing animals. Some rely on private philanthropy, as in the use of rescue groups, which shifts costs of care from public taxpayers to private individuals and groups. Others, such as the use of volunteers, augment paid human resources. Still others, such as adoptions, bring in revenue. And, finally, some, such as neutering rather than killing feral cats, are simply less expensive, with exponential savings in terms of reducing births. In addition, a 2009 national study found no correlation between per capita funding for animal control and save rates. Similarly, a case study of the costs of achieving No Kill at one shelter, the Upper Peninsula Animal Welfare Shelter (formerly the Marquette MI Humane Society) which runs animal control in its community consistent with CAPA, debunks the idea that policies consistent with CAPA are more expensive. In 2006, UPAWS was killing 64% of animals and on the verge of bankruptcy due to the dissatisfaction the members of their community had with their poor job performance which resulted in so many lives being needlessly lost. After embracing the programs and services of the No Kill Equation which make it possible, on which CAPA tenets are based, the number of animals saved rather than killed increased dramatically. In the first year of its initiative, UPAWS posted an annual save rate of 93%. In 2013, UPAWS saved 97%, expanding its safety net with truly cutting edge innovations such as hospice care for terminally ill animals, better efforts to get lost animals home, and expanded programs to keep animals from entering the shelter in the first place. Analysis: For over one hundred years, shelter directors in this country have enjoyed virtually unfettered discretion, fostering and calcifying the unreasonable expectation that citizens and legislators should play no role in the protocols and priorities by which those shelters are operated. Even HSUS has admitted that, “[T]here is actually very little oversight of sheltering organizations” (although this has not stopped them from derailing efforts to rectify this). Laws such as CAPA remove the discretion shelter directors now have that allows them to avoid putting in place those alternatives and forces them, by law, to follow innovative, lifesaving policies and procedures instead: the No Kill Equation. But as with other social movements, whenever such a massive institutional shift is attempted, a dishonest and unscrupulous backlash by those vested in the status quo is to be expected, regardless of how unethical that status quo may be. In the case of shelter killing which treats sentient animals as nothing more than garbage destined for the landfill, it is as unethical as it can be. Moreover, the level of dishonesty in that backlash is often proportional to the success of the alternative model it is resisting. In the case of CAPA and the No Kill Equation model of sheltering it codifies, the level of dishonesty from the heads of kill shelters, their acolytes, and the national lobbying organizations that defend and legitimize them, is, like the huge number of animals they needlessly condemn to death every year in spite of existing alternatives, breathtaking. But there is hope. Despite opposition, over the last two decades, sheltering in this country has undergone a radical transformation, and what was once portrayed as an impossible dream—saving, rather than ending the lives of animals entering shelters—is now a reality in many American communities. And yet in spite of this success and the ability of every shelter director to emulate it if so desired, shelters saving the lives of all healthy and treatable animals in their care remain the minority. If most shelter directors refuse to bring an end to their killing it is within their power to eliminate, what choice have they left us but to mandate and ensure such changes in law? The people of Delaware and other states where CAPA-type laws have been introduced have a right to expect that the shelters they fund with their tax and philanthropic dollars are being run in line with the guidelines that make success possible. Ensuring such protections for animals in law is not “divisive;” it is democracy. * Nor is outside a human home the tragedy it is so often painted to be by shelter killing apologists seeking to justify killing by falsely portraying the alternative as even worse. The risk of an untimely death for street cats is extremely low, with outdoor cats living roughly the same lifespan as indoor pet cats. In a study of over 100,000 free-living cats, less than one percent of those cats were suffering from debilitating conditions. In other words, the risk of death is lower and the chance of adoption higher for cats on the street than cats in the shelter. And in countries outside the U.S., neuter and release of dogs is not uncommon and regarded, as it should be, as an infinitely better alternative than impound and potential death. The argument that animals are better off dead than living on the street, therefore, flies in the face of actual evidence. And just as significant, it also flies in the face of our common experience as living beings who, if given the choice between death at a shelter and survival by our wit, instinct and the chance of benefiting from the kindness of strangers, would choose the latter without a moment’s hesitation. Not only would this choice be our natural impulse, the facts show it would be the smart one, too. Consider this: In a national survey, 96% of Americans—almost every single person surveyed—said we have a moral duty to protect animals and should have strong laws to do so. Three out of four Americans believe it should be illegal for shelters to kill healthy and treatable animals. Specialization and advancements in the field of veterinary medicine have been driven by a population of Americans willing to spend and do whatever it takes to save the lives of the animals they love. In fact, spending on our animal companions is the seventh largest sector of the retail economy, showing steady annual increases even in the face of economic uncertainty, while giving to animal related causes continues to be the fastest growing segment in American philanthropy. And because of this, companion animals who encounter humans often get a helping hand, not cruelty. Had shelters never existed, and it was proposed that a system of death camps be opened to round up and kill millions of them, how many of us would support such a notion? How many of us would argue that the homeless animals for whom there was hope, whom we saw being fed, cared for and even adopted by our neighbors, would be better off entering a facility where they are killed? In fact, over 150 years ago, when the impounding and killing of homeless animals was a new concept, the great Henry Bergh, founder of the animal protection movement in North America, fought the existence and proliferation of such institutions, arguing that stray dogs should be left alone, once famously and without hesitation asserting, “Let us abolish the pound!” In Delaware, cats are better off now than they use to be because they use to end up in garbage bags by the thousands and now, they no longer do.